PHILADELPHIA - The only thing that could stop Rodney Stuckey was an awkward landing on someone's foot. Stuckey scored a season-high 30 points off the bench before leaving with an injury, C.J. Miles added 17 and the Indiana Pacers picked up right where they left off before the All-Star break with a 106-95 win over the Philadelphia 76ers on Friday night. Luis Scola had 16 points for the Pacers, who have won five of six. Stuckey shot 10 for 16 from the field and 8 for 8 at the free throw line, but his night came to an early end when he came down hard on his left ankle with less than four minutes remaining. The eighth-year guard was grimacing in pain and had to be helped off the floor. Although his left ankle was heavily bandaged after the game, Stuckey insisted he'll be fine. "It happens, man," he said. "It's part of the game. Now I just have to go get treatment for it and try to get ready to play Sunday." 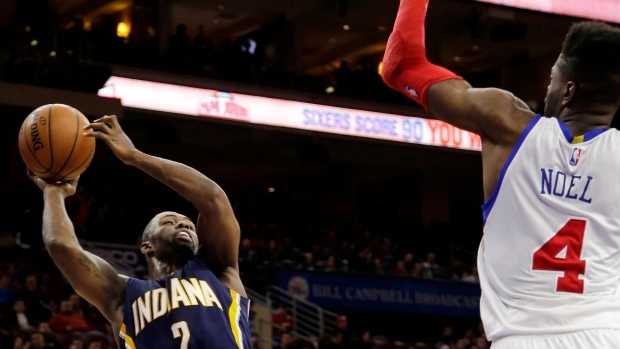 Luc Mbah a Moute and Jerami Grant led the Sixers with 16 points apiece. Nerlens Noel finished just shy of a triple-double with 12 points, nine rebounds and a career-high nine blocks. Five of Noel's blocks came in the first quarter, which matched a Wells Fargo Center record for most in a period. His nine total blocks also were an arena record. According to the Elias Sports Bureau, Noel became the first rookie in the NBA history to have at least 12 points, nine rebounds, nine blocks and four steals in a game since steals and blocks were officially tracked in 1973-74. "How about Nerlens tonight?" Sixers coach Brett Brown said. "He had nine blocked shots tonight and I thought he had 11. ... What he did needs to be acknowledged. His stat line was fantastic." The 76ers had a much different look than 11 days ago when they played their previous game. At Thursday's trade deadline, general manager Sam Hinkie dealt away starting point guard Michael Carter-Williams and swingman K.J. McDaniels in a flurry of moves that netted the team multiple draft picks, as well as JaVale McGee and Isaiah Canaan. McGee, an oft-injured centre who was traded by the Nuggets so they could unload salary, played 11 minutes and scored his only two points on a huge, one-handed dunk in the fourth quarter. Canaan wasn't available, leaving Tim Frazier — who was signed to his second 10-day contract earlier in the day — to run the point. Frazier finished with 13 points and seven assists. In perhaps the most surprising lineup move, 34-year-old guard Jason Richardson logged his first NBA minutes in more than two years. The 13-year veteran, who had been on the mend from serious knee surgery to repair a hole in his cartilage, started in Philadelphia's depleted backcourt and contributed seven points and seven rebounds in 18 minutes. "It was extra special," Richardson said. "Going through what I've been through the last two years, not knowing if I was ever going to play basketball again — this is special. It was an amazing experience." Stuckey took over in the second half, going on a personal 10-0 run to push the Pacers to an 85-61 lead with 2 minutes left in the third quarter. The Sixers made a small fourth-quarter charge but never sliced Indiana's lead to single digits. Miles scored 14 points in the first quarter to help Indiana surge to a 23-16 lead after one. Spurred by 47.7 per cent shooting from the field and 45.5 per cent shooting from 3-point range, the Pacers coasted into halftime with a 58-40 advantage. "The second half (of the season) is important to us," Stuckey said. "We're still in the playoff race. Our mindset is to make the playoffs and that's what we're focused on." Pacers: Paul George, Indiana's injured star, tweeted photos of his teammates wearing hoodies, sweatpants and winter hats during their morning shootaround. The temperature in Philadelphia was in the teens all day but the Wells Fargo Center tweeted to multiple outlets that the arena had no heater issues. ... Indiana missed eight straight field goals from 10:20 to 6:40 in the first quarter. 76ers: Brown is excited to get Canaan into the mix. Before the game, he said the second-year point guard "can score the ball and has a body like Jameer Nelson." ... Franklin, the Sixers' mascot, made his game day debut. The furry dog was unveiled at the Franklin Institute science museum last week. Before the game, Brown said he understood why Hinkie made the moves he did but added that he'll miss coaching Carter-Williams and McDaniels. Still, he's excited to see what the new players will bring during the second half of the season. "I like what I'm feeling," Brown said. "I feel an energetic group. I'm feeling a group that's not going to pity themselves and roll over. So it's on me to move this group forward." Pacers: Host Golden State on Sunday. 76ers: Visit Orlando on Sunday.